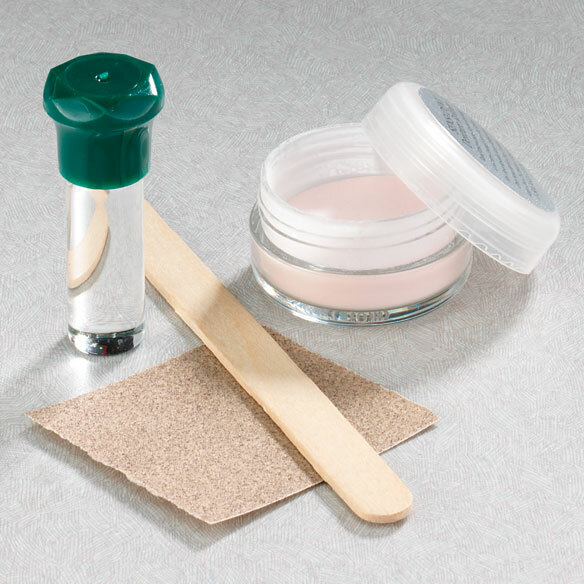 Make dentures feel like new with this easy, do-it-yourself relining kit. Instructions included. Be keenly aware of the times given to mix this and apply. It saved me about $500 that I did not have to spend to get bottom denture relined. It is great stuff. I have no complaints about this product. I found it easier to use than I expected. It has a taste, but like if you went to the dentist. Taste and oder go away. I know where the product is most needed because I am the wearer. I will reorder as needed. Finally a liner I like! I made this with a thicker consistency then directed. Almost playdough consistency but softer. Very easy to use, no harsh feel or smell, soft like rubber when firm. Very happy with the results. It fits my mouth tight. I fixed all my friends dentures too! This has saved me so much money and time. You get the same results as you do from the dentist for a fraction of the cost. I have bought 3 more, to have back up incase I can not find it when I need it again. I used it on my friends dentures and everyone is so grateful to get rid of the rubbing, sloppy dentures and have a good fit. i was skeptical about product but couldn't afford the dentist visit. i tried product last fall, and it is still holding. i believe it when they say it lasts up to a year. i am VERY happy with product, and am ready to buy again. I think this product is fantastic! My dentist charges $1,000 for relining my dentures for the same length of time. New dentures did not fit at all well. Sensi-Dent has provided the pain relief & the ability to bite & chew!!! After using the reliner,I only use a fraction of the dental adhesive that I used to.If this stuff holds up for 5 or 6 months --it willbe well worth the price. A "First" That Won't Be a "Last"
Just had all my teeth pulled, so as my gums were shrinking and healing, I needed something to tighten up my temporary dentures. This product was fabulous and made the transition so easy & painless. This is easy to use after to learn how to mix it. I can't wear my dentures without it. Glad I found it. This product is so amazing! When I got my teeth out I was fitted right away for my plate so my gums were very swollen, so my plate ended up too big once they went down. This fills in the space w/o looking bulky. Only thing is I need to figure out how to remove it so I can place a new layer in! Anyone have any tips?? I needed just a little lining and was very tired of using adhesive. Mixed it up and put it on my dentures. Waited the 5 minutes and it was a nice even layering of reliner. Has been a few weeks and it's still on there. Haven't used adhesive since. On the places that it flowed over, it was easy to remove. Find it quite expensive though. Seen other products like it much cheaper elsewhere. This product was easy to apply, comfortable, made a big difference in my ability to maintain a clean comfortable mouth. Directions were easy to understand. Products says it lasts 6 months,not sure if that is true or not I've only had reline for about a month. providing a cup. Not as advertised. LOOKING THROUGH INTERNET AND TRIED ALL OTHERS THAT DIDN'T WORK. Chosen by husband who wears dentures. Good reviews. I've used this product and it works very well and is very easy to use. Because of the reviews.... but when the shipping and handling is 33% of the product price....why do you have to pay for shipping plus an additional fee for handling? Purchased based onn customer reviews. Wanted to try this to see if I can avoid a $650.dentist bill for now. My husband chose this for himself. He thought it would be the best product to use without having to remove gummy, sticky residue from his gums after removing his upper denture. I liked the reviews you supplied. I don't want to pay $600 to have dental office recline my teeth! My upper dentures have a hole in them from wear from eating mints all the time. I have paid to have them relined before to the tune of over $900. After researching the cost of relining my dentures,I had no choice but to try your product . Other comments were helpful for this decision,and I will post another comment after I try the product. I read the comments of other customers buying this item,all said good product. a very good item ..works excellent. Reline's are so expensive so giving this a try. Hope it works? So I don't have to make a round trip of 130 miles to the dentist. I can take care of relining myself since I've been wearing dentures for almost 50 years. I need a new one and this is just what I've been looking for. Referred by a friend to the website and the product was recommended. does it taste horrable and burn real bad? BEST ANSWER: Thank you for your question. We have not heard of any one talking about taste or burning. This item should not have a bad taste and should not burn. We hope this information will be of help to you. How do you remove it? It's been several months since I put it on and it is beginning to separate. I can't seem to get it all removed. BEST ANSWER: When it holds that well to certain spots i leave it. Any type of adhesive holds on to its self better than anything else by far. And if your using this product you can afford to be aggressive with the removal. they already don't fit ! Anything you do will be filled by the re-liner. I just keep putting the plate in very hot water and working with it. Haven't found an easy way. Is this kit enough for both dentures? BEST ANSWER: Yes, one kit is enough for me. I have never used two kits. Just be very careful. It will do both dentures. I have a few teeth left, how will relining be done since there are holes in dentures to go around the teeth? BEST ANSWER: You'll see when you mix it up. When you follow the directions you'll see when the material starts to set. Thats when you take a knife and trim it to fit inside the holes. its very forgiving. You always pour the liner on the part that will be under the teeth. Avoid putting product in the holes. I have lost my instructions so I don't know how long I need to leave dentures in after I put the reline mixture on them? BEST ANSWER: Thank you for your question. You need to bite down firmly and keep your mouth closed for 2 minutes. We hope this information will be of help to you. how it mix and use? BEST ANSWER: Just mix equal parts of both products together until you get the right consistency, apply to plate and insert into mouth and bite down. Hold for the proper time and remove. Trim excess and volla. You are done. Works really well and I was very happy in how it works. Pour the pink powder into a suitable (disposable) container, then pour the liquid into the same container, stir until the powder is fully saturated by the liquid and the mixture is like a mud, then apply to the inside of your denture and spread evenly. You have to follow the instructions and it tells you step-by-step. Read carefully ahead of time, as there are things you must do before you start. Is there any way to get a copy of the preparation and application instructions? by way of email would be great, or post this website. Just the major points of the instructions will do. All i can remember is to leave in frig for 1 hour before mixing. Not sure of time to let it sit before spreading on denture or how long to leave on denture before putting into the mouth to make the impresstion. Receiving that bit of info from anyone out there would be awesome. I need it before this weekend. Thanks everyone! What ingredients are contained in sensi-dent? BEST ANSWER: Thank you for your question. All the manufacturer discloses is that the sensi-dent does not contain menthocrylate. We hope this information will be of help to you. can you use denture glue with it? sounds like the one at the store is there any difference? BEST ANSWER: Thank you for your question. We are not able to answer this questions as we are not the manufacturer of this item. We do not know if it is the same product. We hope this information will be of help to you. I don't really know. I didn't know any store had it . I was looking for something to help me and a friend told me about Easy Comforts. But you've got me curious enough to go and see. BEST ANSWER: I just used it last wk don,t no how long it will last I am happy when th using it so fiar, il was able to eat steak with no problem.